Vegas laughs with Howie Mandel - Casino Inside - The gambling industry magazine! He’s got tons of talent. He knows it and the audience knows it. Otherwise they wouldn’t watch him, not even live in sold-out shows in Vegas or in the shows he is hosting. We’re talking about Howie (Mandel, who put the smile on the faces of millions of people around the world. Whether he starred in cartoon movies for children back in the 90s, such as the famous “Bobby World” series, which was also broadcasted in Romania, or as a comedy actor making the audience rise to their feet at every show in Las Vegas, Howie Mandel remains one of the show business pioneers. At 63, Mandel still has a lot to offer to the public. Currently, he hosts the ‘Deal or No Deal” TV show, which for a short period of time could also be watched in Romania. Mandel is also the fourth and oldest juror of ‘America’s Got Talent”, the world’s biggest talent show. Howie Mandel has discovered success on the American soil, the realm of all possibilities, in the United States, though he is Canadian. He was born in Toronto, Ontario, in 1955. His professional career would begin several decades later after participating in The Comedy Store show. A comedy show producer was impressed after seeing him and took him in the opening of David Letterman. Several offers followed and contributed to the rise of the comedy star. He served as an opening act for the Diana Ross show in Las Vegas and eventually gained a role in the “St. Elsewhere” series. It was one of the first shows where he described medical cases and techniques in a realistic and tough manner. Mandel starred as Doctor Wayne Fiscus. The series also co-starred William Daniels, Ed Begley Jr., Denzel Washington and David Morse. In addition, Mandel continued to do stand-up comedy, as well as to provide the voices to characters. He was the voice behind Gizmo in the “Gremlins” movie (1984) and also in the second part, Gremlins II: The New Batch (1990). Mandel provided also the voices to several characters in the animated television series “Muppet Babies”. Mandel found even greater success in the world of children’s television. He created the popular animation series “Bobby’s World”, which was broadcasted by FOX from 1990 to 1998. In addition to being a screenwriter and executive producer, Mandel provided the voice to several characters, including Bobby, a four-year-old child who was doing all sorts of adventure. The cartoon popularity was so great that it reached Romania in the early 00s when it was broadcasted by the former FOX Kids television station for children of that time. Few know that the man who appeared in the show back then is the same as Howie Mandel today. The difference is certainly the hair Howie had when compared to his today look. 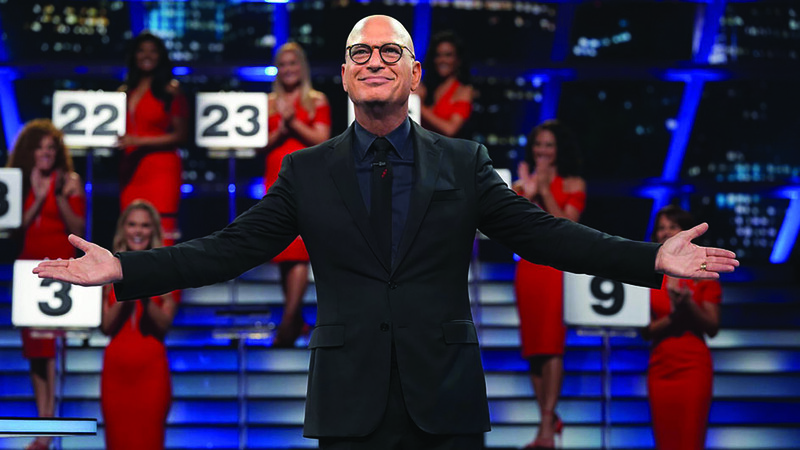 A new show that has made headlines in the United States and which Howie Mandel hosted has once again come to our country, “Deal or No Deal”. The show has not been intensely broadcasted in Romania, but almost 14 years have passed since its debut in the United States and its host is the same. But most know Howie Mandel from the “America’s Got Talent” show. He is one of the four jurors and probably the most pleasant. Howie joined the team in 2010 and is the oldest jury member in the history of the contest. When he came to judge the contestants, Sharon Osbourne and Howard Stern were sitting next to him at the jury table. Meanwhile, the last two left the show, and were replaced by Mel B, Heidi Klum and Simon Cowell, who is also the creator of the show. Although he has had many projects and collaborations that have contributed to his success and reputation, Howie Mandel has never quit the stand-up comedy. No wonder why AGT winners have their own shows in Las Vegas. The city in the heart of the Nevada desert is the perfect place for relaxation to blend together with entertainment. The proof is that Mandel, a professional comedian for over 30 years, has his own show with David Spade in the famous resort The Mirage Hotel & Casino. “Spade and Mandel seem to be a strange duo. Spade: an actor and a popular comedian, known for his time at “Saturday Night Live”, as well as from the “Tommy Boy” and “Joe Dirt” movies. On the other hand, Mandel hosted several shows and saw hundreds of comedians at “America’s Got Talent”. So, why coupling…? Who knows? But we know these two are funny”. This is the invitation to the two shows, which take an hour and a half, on average.